Kids are kids, and shouldn't be treated like professionals or big time collegiate athletes. Me neither. I caught every pass. Made every shot. Never struck out, let alone when it mattered most. And losing a game — no chance. So when people try to tell me "there's no such thing as perfect," I simply shake my head in disgust at the mere assertion of such a mediocre mindset. I'm kidding, of course. But what isn't a laughing matter is what I'm sadly confronted with every year, every season, and in nearly every sport, as I raptly watch wins and losses, highlights and lowlights, and kids do what kids are inevitably going to do — make mistakes — from the sidelines. And that's people mocking their effort. 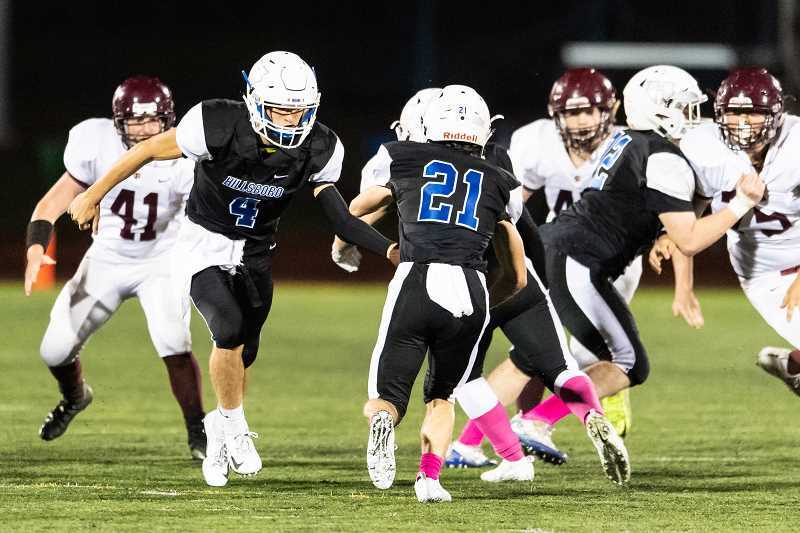 Last Friday, the Hillsboro Spartans football team lost a game to Forest Grove. There were some nice catches, some equally nice runs and a handful of quality hits, not to mention some successful kicks, some nice blocks and some nice throws from a couple young quarterbacks finding their way in the varsity game. But in addition, there were some drops, missed assignments, failed kicks, and yes, turnovers — one at an inopportune time. With the game seemingly in hand, the Spartans fumbled the ball back to the trailing Vikings, and a couple plays later, they watched as a Forest Grove receiver ran free up the sidelines en route to what would ultimately be the winning touchdown with just a minute remaining on the clock. In the aftermath of Hillsboro's shocking defeat, there were tears, frustration, and anger at what had transpired, but while all that is to be expected in the wake of such a heartbreaking defeat, what we shouldn't expect — what shouldn't be considered normal — is the abhorrent behavior by a few, at the expense of kids doing their best. Without getting into specifics, I heard both students and fans — of both teams — making light of how the game ended and mocking the players guilty of imperfection. There were snide remarks, finger-pointing and blame directly cast at a couple different individuals who were part of the late game action. And you know what? That's garbage. These aren't professionals, or even high-level college players in the middle of big-money collegiate athletics. They're teenagers, kids, playing a game for their coaches, teammates and schools they represent. There's no money in it, no scholarships and, in most cases, no notoriety outside of a photo or local article by yours truly or any one of the other handful of publications covering high school sports. Assessing blame at this level or critiquing a play or mishap has no place in high school sports. It's understandable to be upset or disappointed in a play or outcome — after all, that's human nature — but I have no understanding for lashing out publicly at a kid for making a mistake in a game that in the end has little to no bearing on you or him/her going forward. Especially when if you stop and think, you've likely been there and done that. I've made an error, dropped a pass and missed a putt at a teammate's expense, and it stinks. And I'm guessing you have as well. Whether on the playing field or even at work or somewhere else in life, you've inadvertently let someone down, and the pain you feel is bad enough without someone who's sitting idly by to make you feel even worse. So to those "imperfect kids," I say welcome to the club. Like the rest of us, you made a mistake, and I assure you somewhere down the line, you will again. But it's about effort and intent, and as long as the effort was there and your intent was good, you did your part. And to the hypocritically virtuous people atop the peak of Mt. Pious, I offer you this: A notable old coach in the area once told me, "I've never seen a kid make a mistake on purpose." That's something to consider next time you want to lash out.